Are Your Thoughts Keeping You From Serving? Blaine and I were in Me and Ed’s pizza parlor last year waiting for another amazing pizza. That’s when we saw the T-shirts they had for sale. 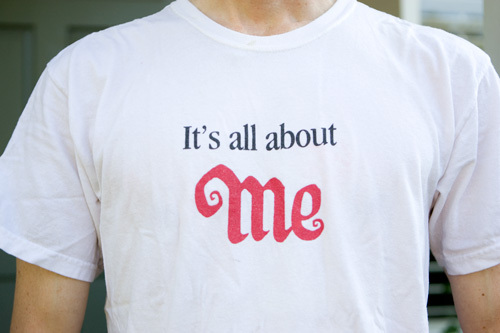 On the front, in big red letters, the shirt said “It’s All About Me.” And on the sleeve was the “Me and Ed’s” logo. How cool is that? We couldn’t resist it for a second. We both bought a shirt. And I’m still wearing mine today. But Does This Statement Encourage Selfishness? I’ve had people scowl at me with this shirt on. One tow-truck driver even told me directly that it’s not all about me. As human beings, we don’t like selfishness. We respect selfless service, and giving, and generosity. Yet we secretly wish it really was all about us. If you’re like me, being self-absorbed comes naturally. Service is something I’d rather put off for another time. But service actually is my medicine. In reality, I do love it when I volunteer. I feel great when I offer up my services to others. It feels fantastic to be generous. But, unfortunately, the inspiration to serve doesn’t last that long for me. I volunteer, feel good, and then go right back to my little world of taking care of me. So if it feels so good to serve, why do I resist it so much? We all have these beliefs of one kind or another. Here’s a chance to take a look at them and see if they are really true. If I believe that these concepts are true, I have no choice but to discontinue serving and go back to my survival mode. Last week, for example, I did some service at Byron Katie’s nine day retreat called, “The School For The Work.” I did the photography. Here are some of the beliefs that I wrestled with last week. I’m losing income while I’m away. I need to focus on making more money. Photography is too much work. I’m not a professional photographer anymore. I will be setting a precedent. As the photographer, I don’t get to participate in the exercises. I have nothing to gain from this. I will need a week to recover. This doesn’t fit into my plan for my life. This is a snap shot of my raw mind. These are the thoughts that hold me back from service. It’s great to get them down on paper. Now I can go through them one by one and question them using the four questions and turnarounds of The Work of Byron Katie. The fact of the matter is, last week actually gave me a ton of energy. In spite of my resisting thoughts, I really enjoyed it. But now at home, as I look back on it, my list of opposing thoughts comes back to the forefront of my mind. I find myself building up an internal resistance again to doing this kind of service in the future. These unquestioned thoughts are slowly taking over my life again. So far I’ve done The Work on the first six items, and I feel much clearer. I can see now that I’ve had an issue ever since I was a professional photographer. I’ve thought, “I have to get paid big money before I take any photos.” This idea has prevented me many times from photographing even for my family, let alone for a retreat like I did last week. Doing The Work on this list is slowly shifting my perspective. I’m not worried about setting a precedent now. I can always say no in the future if I just don’t want to do it. I did the photography because I like to do it, not because it pays. It was a choice I made freely and enthusiastically. Do you like to serve in some way or another? What prevents you from doing it? Choose a time when you wanted to serve but didn’t. Or a situation where you want to be of service, but keep resisting doing it. Choose one specific situation. What are the thoughts that are stopping you? Make a list, and take them to inquiry. For each belief that you write down, use the One-Belief-At-A-Time Worksheet to do The Work. If you’re new to The Work, you can read more about The Work, and how to do it here. We all love to serve. It just feels right. But we all have our reasons not to serve. When you do The Work on your list of reasons, you may find that you’re actually much freer to give than you thought you were. The result is that you get to be generous, and to feel the joy of that. You may even find that actually “It’s All About Me,” after all. The T-shirt was right. Even service is all about me because it makes me feel really good when I do it.